The Bechtler Museum of Modern Art is a powerful and imaginative setting for events and meetings. Located at the Levine Center for the Arts, within walking distance of the Charlotte Convention Center, the Bechtler is a unique space designed by internationally acclaimed architect Mario Botta. In addition to museum event rentals for corporate and nonprofit organizations, the Bechtler now provides rental space for private parties and social functions such as weddings, birthdays or anniversaries. Price includes space rental fee only. All staffing and hospitality costs are additional. The Bechtler's lobby can comfortably accommodate up to 120 guests for a sit-down function and 180 for a standing reception. The lobby's glass front walls and doors provide stimulating visual interplay between the city's street life and a special event taking place inside. 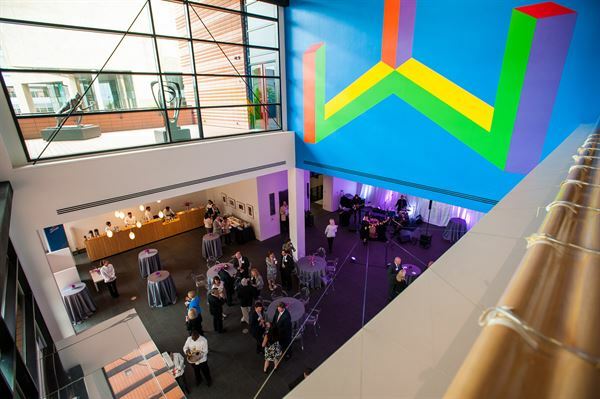 Offering airy, modern surroundings, granite floors and a colorful 23-foot-tall wall drawing by conceptual artist Sol LeWitt, the museum's lobby delivers an inspired atmosphere for events and celebrations. The lobby/plaza combination accommodates up to 375 for a standing reception. Events on the plaza take place under the museum’s cantilevered fourth-floor gallery which is suspended by a voluminous column. The whimsical Firebird sculpture serves as backdrop for all plaza events. The second-floor sculpture terrace is a perfect setting for a cocktail reception, offering sweeping views of the Levine Center for the Arts and The Green park. The terrace can accommodate up to 50 people for a standing reception. For meetings, workshops, retreats and programs, consider the Bechtler classroom, which offers a Wi-Fi connection and access to audio visual equipment. A number of classroom layouts are available; most room configurations accommodate 25 to 30 people.